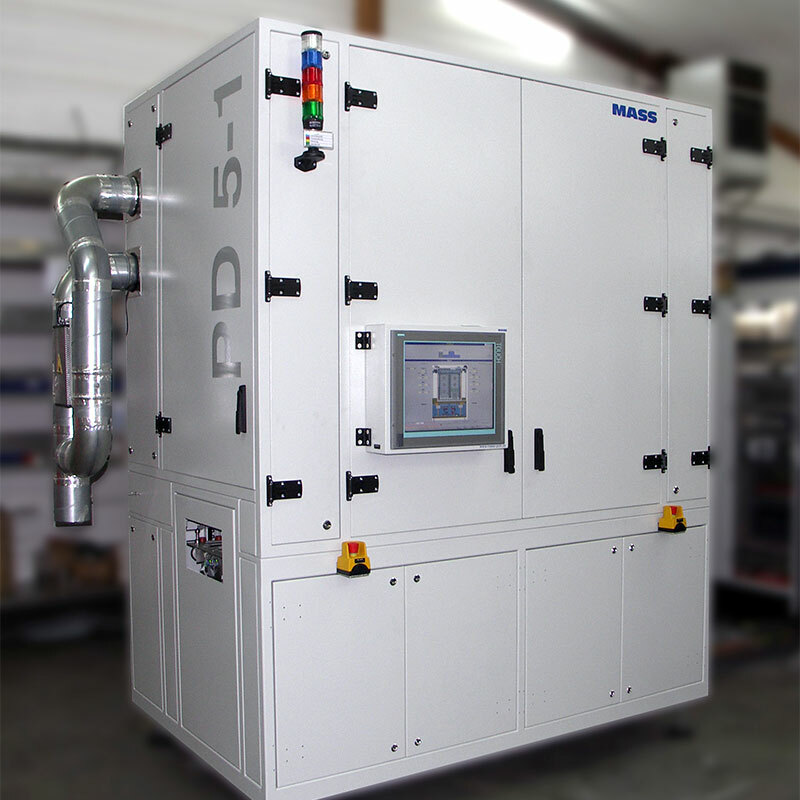 The PD continuous dryer system is designed for heating products and for drying pastes and lacquers. The paternoster design saves a great deal of space and offers a high degree of use with a relatively small footprint. Customer products are transported through the processing chamber on an internal MASS goods carrier. The heating process takes place using convection heat. In order to extract a large percentage of the solvents, exhaust volumes can be adjusted for each heating zone. The modular construction allows for 2-10 heating circuits, as needed. The index for goods carriers can be between 20 and 150 mm, as required. Visualization is done using Windows 7 and can be adapted for an existing MES system. The HST 200 dryer system is part of a production line for manufacturing thin-film solar modules, and is used to burn screen printing ink onto the substrate. The heating zone for the HST 200 consists of 5 separately controlled convection heating zones and a cooling zone. Glass panes are taken into the infeed via toothed belts and transported to the internal MASS goods carriers. The goods carriers move upward through the heating zones according to the preset interval times. Once they reach the top, the goods carriers are transported to the downward tower and move downward at regular intervals through the heating and cooling zone to the outlet area. The distance between the individual goods carriers has an index of 38 mm. The goods carrier is unloaded at the outlet. Next, it is transported back to the infeed, where it can be loaded again. The goods carriers are designed so that no chains or chain guides are needed. The MT 200 drying unit is designed to heat ceramics and to dry pastes. The products are conveyed in a magazine and transported through the unit in a stack. The heating process takes place using convection heat. The desired temperature profile can be set using multiple heating zones. The transport system consists of an accumulation roller transporter and a frequency-regulated drive motor. The VDH dryer was designed for various applications in the area of drying circuit boards. The typical drying temperature is 150 °C. The system has a modular structure. 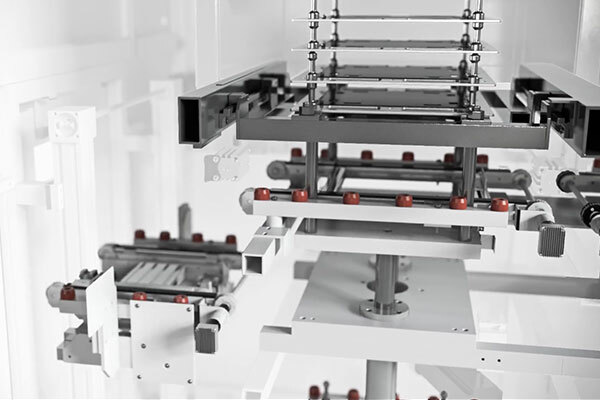 The infeed and outflow modules can be expanded by adding any number of drying modules. In addition, various special solutions are available. 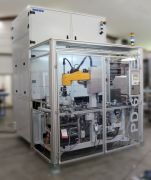 This compact, one-sided UV dryer was developed especially for inline production. It is mainly used for UV coating of photosensitive soldering stop lacquers before the final thermal curing step, to minimize condensation. The UV burners (10 KW = 140 W/cm) can reach speeds of up to 2.5 m/min 1200 mJ/cm², based on IL390. Another benefit is air cooling without shutters; in other words, the burners can be turned off if the downstream machine experiences a disruption. If the machine is restarted while hot, the full UV energy level is restored within 2-3 seconds. Turning off the heater completely does not affect its lifespan; it simply reduces the heat influence and lowers energy costs. The printed circuit boards are dried quickly and evenly using IR radiation. The IR heaters are mounted above the transport level, and the circuit boards are on a flat or V-shaped belt. The dryer module comes standard with 2 heating circuits and is 3 m long (IR/16 KW type). The dryer can be expanded as needed. If it is expanded by 1.5 m, the dryer has one additional heating circuit. The heating circuits can be controlled separately. The target temperature is based on the lacquer properties and the desired speed. On average, temperatures of 90 – 110°C are reached. 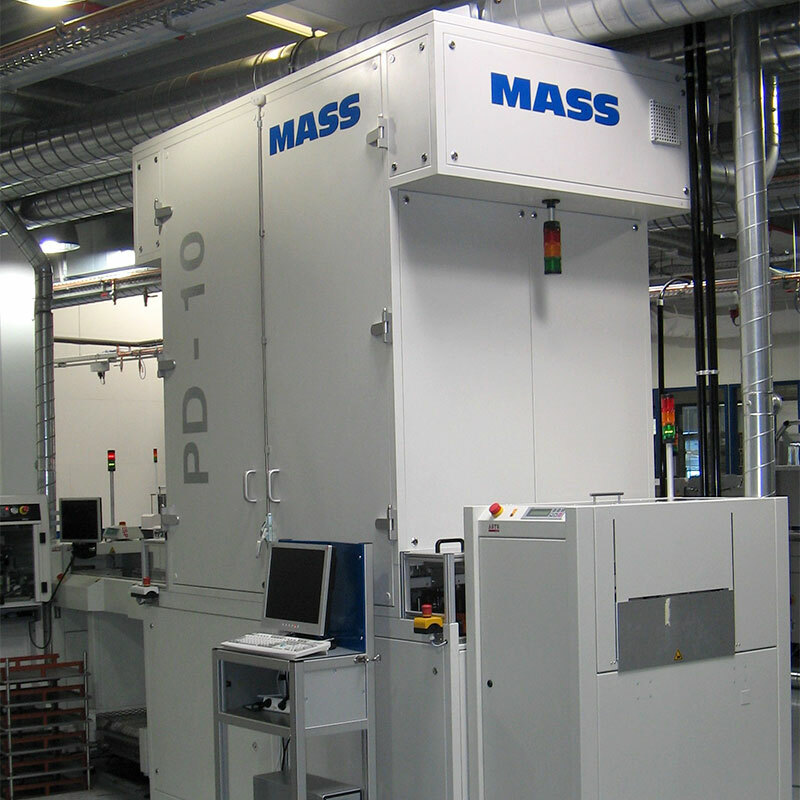 The printed circuit boards are cooled down to about 30°C in an additional cooling module for further processing. Transport speed: 0 – 3.5 m/min.